whatever the matter may be. -William Thomson, First Baron Kelvin, Scottish Mathematician and Physicist, 1824-1907. Abstract: Various methods of quantifying light intensity are examined, with pros and cons of each briefly discussed. The ‘watts per gallon’ rule is useless for LEDs. Preliminary data presents the ‘best’ spectral qualities for coral photosynthesis. The subject of proper illumination for aquaria containing corals and other marine invertebrates has long been a favorite topic of mine and a subject on which I have written extensively. These writings, consisting of hundreds of pages and numerous photos, tables and charts, could make a small book, so it is not surprising that I routinely get email asking a simple question – “Which LEDs are best for my aquarium and its inhabitants?” The answer(s) to this simple question isn’t so simple. A lighting distributor made an interesting comment during a recent conversation: If LED fixtures are compared side-by-side, the observer will almost always buy the one visually producing the most light (thank you, Simon Garratt). On the face of it, this makes sense. After all, illumination is the goal, and brighter must be better – correct? The answer is: Perhaps. 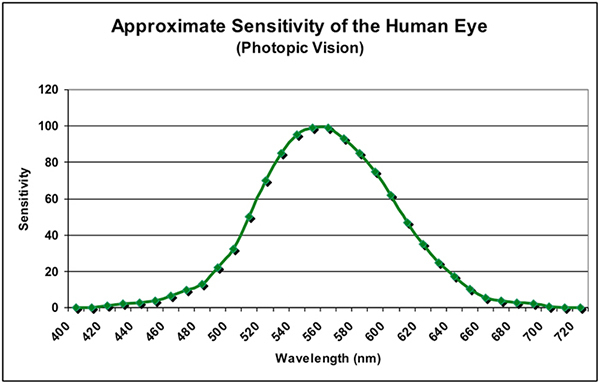 To understand, this non-answer, we must examine the spectral sensitivities of the human eye (scotopic and photopic), basic requirements of photosynthesis, various ways of reporting light energy (photometric units, radiometric units, and quantum units) and peculiarities of light production by LEDs. Before we get started in earnest, let’s define some of the terms used in this article. Definition of Colors Color (or hue) is the property of an object or substance in producing a vision sensation by the way it reflects, produces, or fluoresces light visible to the unaided human eye. Those portions of the spectrum visible to the unaided human eye do not transition clearly between one hue and another, so it should not be surprising that the definition of a particular color varies from source to source. I will use the definitions recognized by the International Commission on Lighting (the Commission Internationale de l’Èclairage, or CIE.) See Table 1. Table 1. Wavelengths associated with emissive, reflected, or fluoresced colors. The Way We Perceive Light and Colors: PhotometryPro: Lux meters are relatively inexpensive. Conversion to quantum units (µmol photons·m²·sec, or PAR) is possible if conversion factors are known. Con: Important spectral qualities for photosynthesis (such as red and blue) are under-reported. A healthy human eye is a remarkable optical device both in its ability to sense light intensity (starlight to blinding intensities) and color (some ten million.) Photoreceptors called cones and rods within the spherical eye-ball collect light energy, with rods being able to collect very low amounts of light resulting in monochromatic night vision (called scotopic vision), while cones can sense higher amounts of light (called photopic vision.) An intermediate stage between these two is called mesopic. 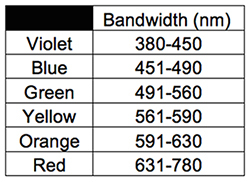 In any case, the maximum sensitivities to light is in the blue-green bandwidth (~510 to 550nm, depending upon light intensity.) See Figures 1 and 2. Figure 1. 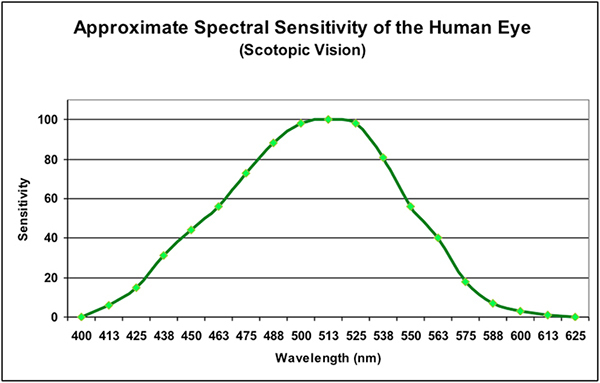 Spectral sensitivity of the eye in conditions of very low light intensity. Figure 2. As light intensity increases, the spectral sensitivity of the eye shifts towards the warmer portions of the spectrum, including more green, yellow, and red wavelengths. Table 2. 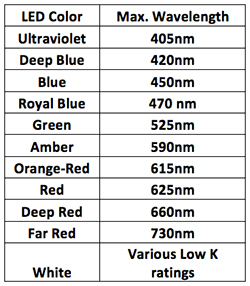 Light (maximum wavelength) produced by various LEDs commonly found in luminaires marketed to the aquarium trade. Compare this Table to Table 1. Light-emitting Diodes (LEDs) – General Comments With the advent of widespread use of LED luminaires for illuminating aquaria, many of the rules-of-thumb should have been abandoned. One such ‘rule’ is that of watts-per-gallon (with the usual rule suggesting the employment of a fixture consuming 3 or 4 watts of power per gallon of aquarium capacity.) I never agreed with this suggestion (could a lamp consuming 3 watts of power properly illuminate a 1 gallon nano-reef? In addition, this ‘method’ ignores the dimensions of the aquarium – especially depth, and disregards the lighting requirements of some animals). However, these seat-of-the-pants recommendations often gain traction and become entrenched in the hobby. With that said, the ‘watts-per-gallon’ rule is certainly not applicable to LEDs, and it should be avoided! LEDs are notoriously different in their light production even when the same voltage is applied to them. Perhaps, the best example is that poor amount of light produced by green LEDs. There are some basic guidelines to consider when purchasing a LED luminaire: 1) The ‘Watts per Gallon’ Rule is Practically Useless. The efficiency of LEDs in production of light energy of various color or hue is better in some than others (one watt of electrical energy applied to a green LED produces much less light than the same amount of power applied to a red one.) See Figure 3. Figure 3. 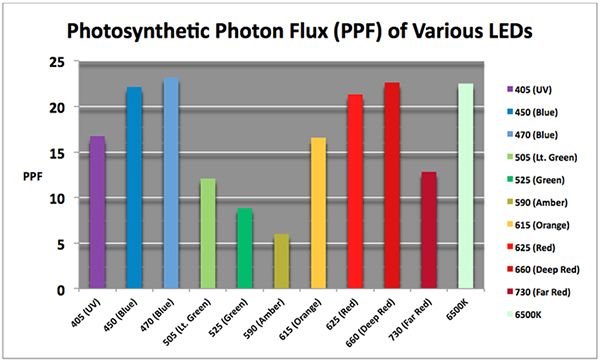 The amount of Photosynthetic Photon Flux generated by various LEDs (per watt of applied power.) Note that some of the radiation produced by UV (405nm), Deep Red (660nm) and Far Red (730nm) might not be measured by PAR meters, especially an inexpensive one costing less $500 or so. Compare this to photometric data in Figure 4. 2) Lux Meters are a Poor Way to Measure LED Output. Although the information provided by a lux meter is better than none at all, we must recall that lux readings are weighted toward the blue-green portion of the spectrum. Hence, green LEDs might appear to be bright to the eye, when in fact they are poor producers of light (power wise.) Even worse, green wavelengths only weakly promote photosynthesis within zooxanthellae. See Figure 4 for data on how the human eye perceives brightness of various LEDs. Figure 4. 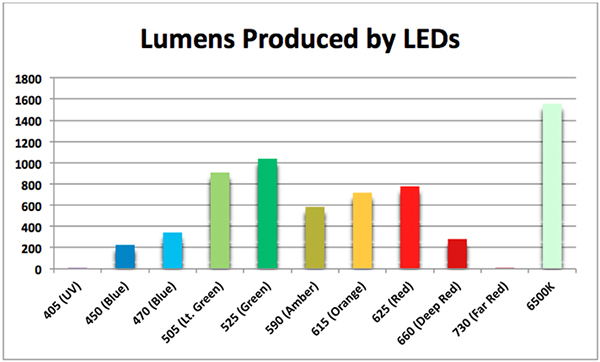 Lumens produced per watt by various LEDs. ‘Brightness’ of these lights is a very poor indicator of their ability to promote photosynthesis. 3) Realize the Limitations of a PAR Meter When Measuring LED Output. While the preferred method of measuring light intensity produced by LEDs is through use of a PAR meter, it is not without caveats. Even the most expensive meters and sensors (those costing a couple of thousand dollars) don’t ‘see’ wavelengths between 400 and 700nm equally (theoretically they should.) Violet wavelengths are generally under-reported; as are wavelengths longer than about 660-670nm (depends upon the make of the meter. Less expensive meters are more prone to underreport red.) Bear in mind that perhaps as much as 40% of the output of an ‘ultraviolet’ LED can fall outside of the range sensed by most PAR meters. See Figure 5. 4) Ignore Radiometric Measurements. Though not commonly seen in hobby literature, radiometric measurements do occasionally make their way into print. Radiometric measurements are practically useless when it comes to photosynthesis. Zooxanthellae don’t care about radiometry and the differing energy levels of, say, blue and red photons – and you shouldn’t either. 5) Ignore Chlorophyll Absorption Characteristics Based on Terrestrial Plants. This is a pet peeve of mine – many reports to the hobby include charts demonstrating the absorption characteristics of chlorophyll a (good) and chlorophyll b (not good, since zooxanthellae contain chlorophylls a and c², as well as the accessory pigment peridinin which absorbs light into the green portion of the spectrum.) This is the reason zooxanthellae appear brown.) Although the absorption characteristics do not seem to differ greatly, the use of the incorrect photopigments is a sign that the author has not conducted adequate research. See Figure 6. Figure 6. 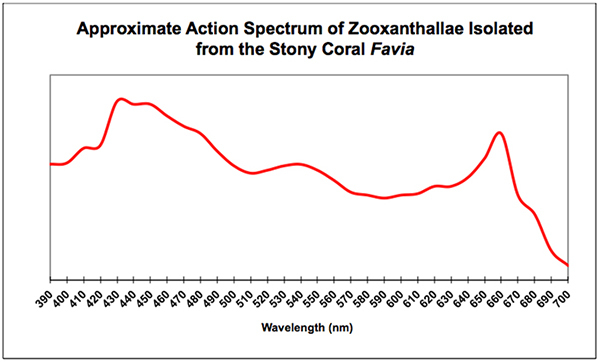 An action spectrum, such as this one, describes an effect (such as oxygen production) when zooxanthellae are exposed to monochromatic light across the visible spectrum. The absorption peaks in the violet/blue and red portions of the spectrum are due to the presence of chlorophylls a and c², while the hump at about 540nm is due to the accessory pigment peridinin. 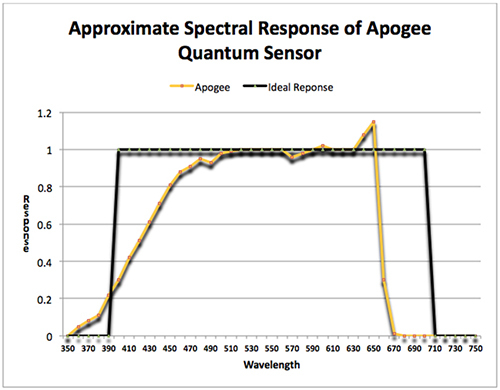 Compare this to the spectral sensitivity of a relatively inexpensive quantum meter seen in Figure 5. LED Light Intensity and Coral Photosynthesis As difficult as this may be for many to believe, most corals’ zooxanthellae simply don’t need a great deal of light in order to thrive. Even those zooxanthellae in corals existing in shallow tide pools here in Hawaii reach maximum photosynthesis by 9 or 10 am. After this point, protective pigments called xanthophylls are activated by excessive light (and a shift in the pH of parts of the photosynthetic apparatus) and shunt light energy away from photosynthesis. Just a couple of years ago, I believed that 100 µmol·m²·sec was close to most corals’ minimum light intensity requirement. Recent discussions and observations of zooxanthellae photosynthesis rates have lowered this minimum to less than 50 µmol·m²·sec if, and I repeat if, the spectrum is skewed towards the violet and blue portions of the spectrum. One reason for the success with seemingly low PAR values undoubtedly has to do with the poor spectral response of the quantum meter used to make the measurement. However, we cannot ignore the high relatively high amounts of PhotosyntheticallyUsable Radiation (PUR) generated by certain combinations of LED lamps. 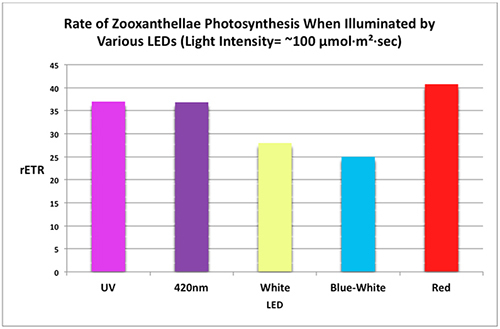 Recent experiments have shown that certain LEDs are more efficient in promoting photosynthesis in zooxanthellae of Porites lobata, and absorption protective or inefficient photopigments (xanthophylls and beta-carotene) seems to be responsible. See Figure 7. Figure 7. Rates of photosynthesis (rETR, for Relative Electron Transport Rate between Photosystem II and Photosystem I) when equal illumination is provided by variously colored LEDs. Carotenoids (xanthophylls and carotenes) seem to be in sufficient quantities to effectively compete with photopigments (chlorophylls, peridinin) for light energy. For more detail, see Riddle, 2014. In Closing When a number of factors are considered, it becomes obvious that judging light intensity by visual means alone is a poor way of determining lamps’ outputs. Radiometric measurements have their place, but using them in an attempt to judge lamps’ effects on photosynthesis should be avoided. Until we have conversion factors for converting photometric units (lux, for instance) to quantum units (µmol photons·m²·sec), use of relatively an inexpensive lux meter is of limited value. The best method continues to be use of a quantum meter combined with an understanding of spectral absorption characteristics of zooxanthellae, and recently presented information on effectiveness of LEDs in their promotion of photosynthesis. Above all resist the temptation in believing more light is better. LEDs are becoming more and more powerful and, combined with light-focusing lenses, now rival the output of older methods of lighting including metal halide lamps. GlossaryPhotometry: Measurement of light (that electromagnetic radiation visible to the unaided human eye – ~360 to 830nm.) Common photometric units include lumens, lux, candela, etc. Other methods include radiometry, and quantum units. Brightness: A visual sensation where an area appears to exhibit more (or less) light. ‘Bright’ and ‘dim’ are adjectives describing ‘high’ and ‘low’ brightness (respectively.) Candela (cd): A unit of luminous intensity. Candela per square meter (cd/m2): A unit of luminance. Scotopic: “Night vision” – A form of limited spectral perception when light intensity is less than a few hundredths of a candela per square meter. Photopic: When light intensity exceeds several candela per square meter, color vision (through light collection by photoreceptors (cones) in the eye’s foveola) becomes possible, and is called photopic. Radiometry: Measurement of visible radiation energy as well as those bandwidths in the ultraviolet and infrared portions of the spectrum. A common radiometric unit is watts per square meter (w/m²). Radiometric power is weighted towards shorter wavelengths since they are more energetic (that is, blue wavelengths possess more energy than, say, red wavelengths), but this matters not in the promotion of photosynthesis since blue or red photons, once absorbed by chlorophyll a, are equally efficient (photosynthetically speaking.) Spectral Radiant Flux: The amount of energy (watts) emitted by a light source per unit of wavelength. Bandwidth: ‘The difference between the upper and lower frequencies of electromagnetic radiation’ is the technical definition. For our purposes, the breadth of light (expressed as nanometers), such as that generated by a particular light source. Emission: The optical characteristics of a LED with the peak expressed as wavelength in nanometers. Luminaire: The technical name for a lighting ‘fixture.’ Nanometer: One-billionth of a meter. Often used to report the width of light waves (photons.) Photosynthetically Active Radiation (PAR): Visible radiation in the 400 to 700 nm bandwidth. Most of this radiation promotes photosynthesis, but to varying degrees. Photosynthetic Photon Flux: Number of photons (particles of light) between 400 nm and 700 nm that promote photosynthesis. Denoted as micromoles per square meter per second (µmol·m²·sec.) Reflection: Return of radiation by a substance or object without a change in color and without fluorescence. Acknowledgement Some of the information in this article comes from the website of the Austin Texas based company Build My LED. Many thanks to Nick Klase and Randy Johnson for making this information available. References Hunt, R.W.G., 1998. Measuring Colour. Fountain Press, Kingston-upon-Thames, England. 344 pp. Kirk, J.T.O., 2000. Light and Photosynthesis in Aquatic Ecosystems. Cambridge University Press, Cambridge, United Kingdom. 509pp. Riddle, D., 2014. Photosynthetic efficiencies of LEDs: Results of short term exposure to LED lights.http://www.advancedaquarist.com/2014/5/aafeature Thimijan, R., and R. Heins, 1983. Photometric, radiometric, and quantum light units of measure: A review of procedures for interconversion. HortScience, 18(6).